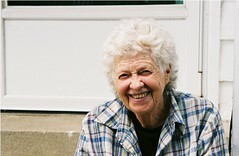 That's my grandma a few weeks ago, on the steps at her house. Now I wish that I had taken a photo of her and my grandpa together - I took a picture of each of them, but not together. Next time I stop off at their house, I'll have to get one. Possibly it will be near Halloween- I hear through the family email grapevine that my neice is having a Halloween party, which could be much fun to attend.